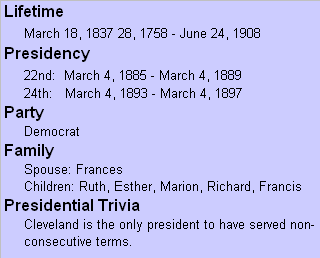 As Cleveland served as president on two separate occasions, I thought it fitting to give him two separate quotes. The first appears to be a statement against what some refer to as trickle down economics. It is interesting that the quote came about a hundred years prior to America’s best known proponent of trickle down, President Reagan. Same setting, same story, different cast, different time; such is the nature of human events. I think the second quote is spot on! Our government has always depended on the premise that the electorate was part of a moral and just society, and that they were interested in and educated about the issues. If our government is not working, we must strive to better ourselves in these areas and I’m sure the quality of our leadership would improve as a result. After all, we have a representative government, don’t we?